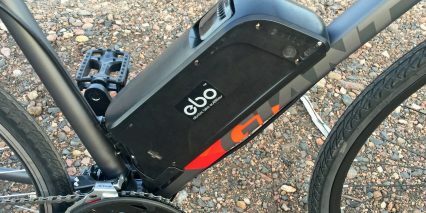 Electric Bike Outfitters (EBO) is a Denver, Colorado based company that has been in business since 2015, and is now expanding to other states and even shipping ebike kits worldwide! The founder, Jason Livingston, has always struck me as a relaxed and honest guy. I have known him since 2015 when we reviewed some of his first products. 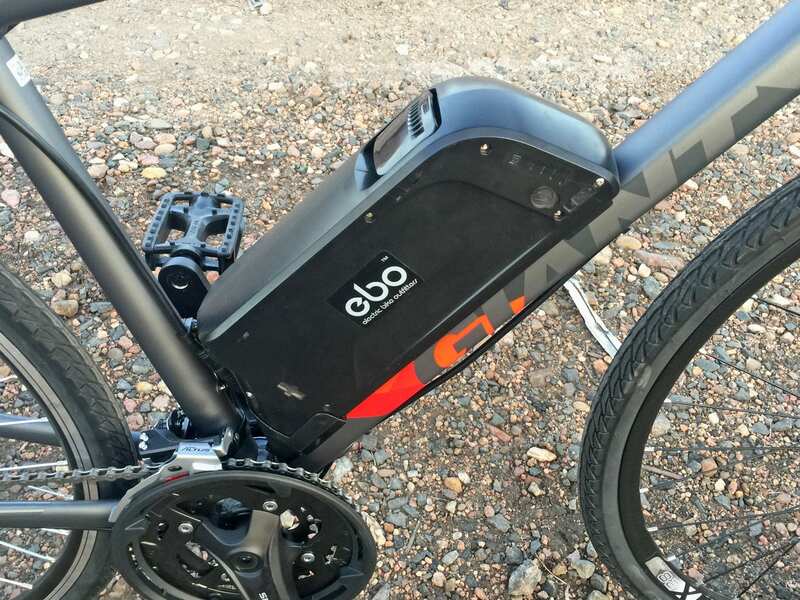 EBO kits have limitations, sure, but the 30-day return policy and one-year warranty is reassuring for a product like this, that tends to be priced lower and is prone to more complications than complete electric bikes. He does such a good job in fact, that many electric bike stores will carry his kits and perform conversions for customers so they don’t have to get their hands dirty. I have consistently been impressed by the lengths to which Jason will go to customize each sale… for the Burly kit, he offers hub casing and wheel color options (black or silver) as well as two display types, a trigger, half-grip, or full-grip twist throttle, and hand spoked 16″, 20″, 24″, 26″, 27.5″, 28″ (or 700c), 29″ or even fat bike rim! 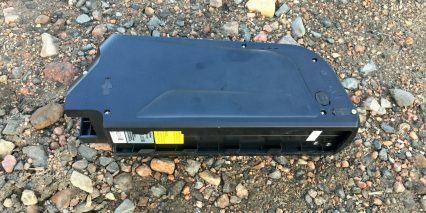 That means you could convert everything from recumbents, to kids bikes, to full-sized city bikes, tandems, trikes, and even mountain bikes, as long as you can figure out a way to mount the battery pack. Electric Bike Outfitters will even create cables that are longer than normal, so you can mount the display, battery, and throttle in the best possible locations vs. compromising. You can see the EBO headquarters location and workshop in the video review above, and it’s clear that Jason is organized and detail oriented. Compared to most purpose-built electric bikes, the 48 Volt Burly conversion kit is affordable and flexible, but not quite as beautiful looking because of the extra cables and bigger battery box. It helps a lot if your bike frame is black or dark grey like the Giant road bike example. Settings wise, you can lower the top speed to feel safer, make the throttle active in assist level zero so you can ride like a scooter, and enable cruise control so your wrist won’t get tired! So many options, but the default configuration is a 20 mph top speed with throttle override (at full power) in assist levels 1-5 but not zero. I was told that cruise control is disabled and the bike starts in assist level zero for safety reasons, and that makes sense. 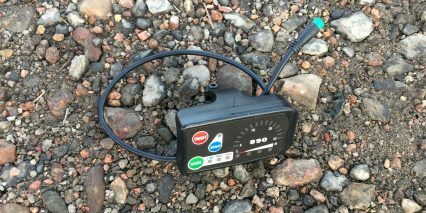 This kit can be adjusted to go faster, and used as a Class 3 speed pedelec, up to ~28 mph, or a Class 4 off-road product with the throttle offering over 20 mph top speeds. You can dig in confidently, and experiment with options by using the online manual that Jason has edited and clarified. You can also just call EBO and reach him for quick questions. In short, this kit will transform almost any human powered bicycle into something a bit more fun, efficient, and capable. Indeed, pulling electricity from the grid to ride further is actually more efficient in most cases than a human being eating and digesting more food and then pedaling! The EBO 48V Burly kit is the second lightest system in his line, and I found that it was extremely satisfying and capable on flat pavement and packed dirt for my 135 lb body weight. As a more active rider, I prefer the nimble feel of geared hub motors and appreciate the lower battery mount position found here vs. the rack mounted EBO Cruiser kit. 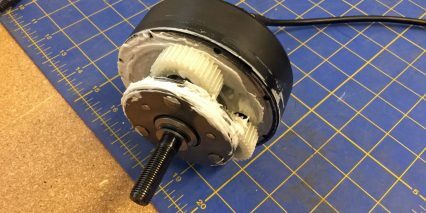 The motor that comes with this kit is a planetary geared design that Jason modified to work with a wide variety of forks and rear dropouts. The Aluminum alloy shell is tapered inward to avoid scraping the frame, a problem I have encountered with some older kits such as the Hill Topper. The EBO planetary geared motor is built onto a 12 mm threaded axle with 9.8 mm flat cuts on each side, which fit into dropouts and push agains the frame as the motor turns. By default, the kit does not come with an external torque arm to spread the force of the motor, because it is not as powerful as all of the other EBO motors, but you can pay a bit extra if you do want a torque arm because of softer or failing dropouts on your individual bikes. The left side of the casing has threaded eyelets for mounting a disc brake rotor, but the rim also has machined sidewalls so the kit is compatible with linear pull caliper or v-brakes in addition to disc brakes. The motor is spoked into each rim by hand, with thicker 12 gauge spokes that increase strength. Jason unscrewed and opened one of the motors so we could look at the copper winding and planetary gearing inside. 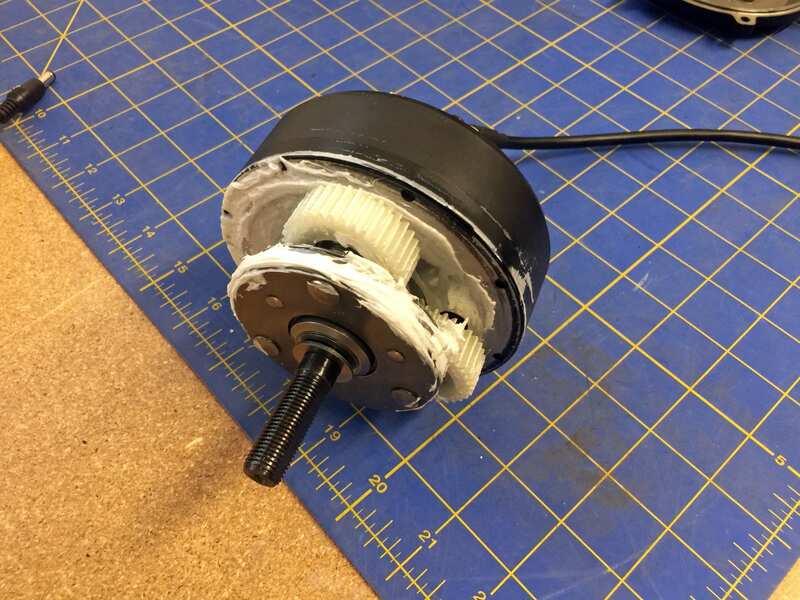 The gears were plastic, which is not uncommon for motors like this, I have found that it is still very durable but also quiet and lightweight vs. steel or aluminum gearing. This motor freewheels efficiently when you coast, only weighs ~5.75 lbs total, and ramps up smoothly vs. feeling jerky. The hub spacing sizes you can oder are 100 mm (for front wheel fork mounting) or 120 mm or 135 mm hub spacing (for rear wheel mounting). If you opt for a rear wheel configuration, you’ll usually get better traction from the tire because body weight tends to be distributed towards the back of bicycles, as well as working with a stronger mounting point… but it can be more difficult to install a rear wheel, and more crowded. This is because many bikes have rear derailleurs and disc brakes with extra cables for shifting and braking. 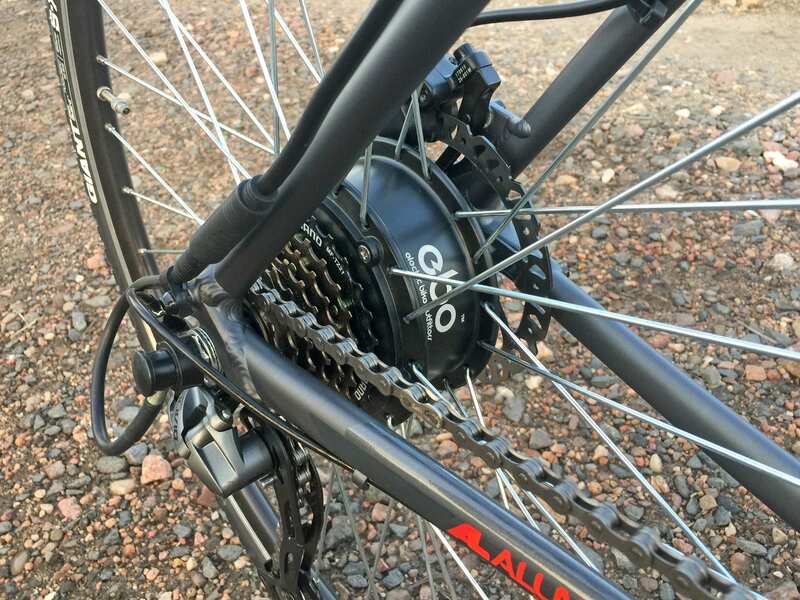 A rear wheel setup will also have at least one sprocket, and the EBO Burly kit can be configured with a single speed, 6, 7, or 9 speed cassette to replace your existing hardware. This kit is compatible with multiple chainrings, and you could end up with a 21 or 24 speed like we saw in these reviews… and that’s rare for purpose built electric bikes. If you currently have a quick release wheel setup, the Burly will replace it with the solid threaded axle and nuts. You’ll have one additional cable to worry about (protruding from the right axle), and this is something to be very careful with. Try not to let the bike tip over and bend this cable or let it snag on foliage or rocks as you ride. 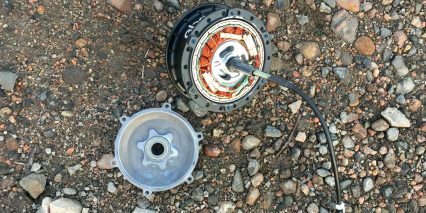 It’s a vulnerable point for most hub motor powered ebikes! 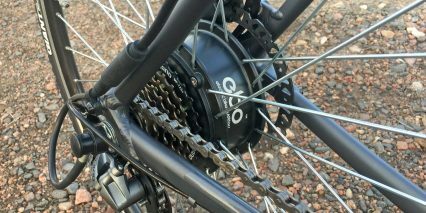 One happy benefit of this drive system however, is that it completely separates pedaling from the motor, and reduces wear on the chain, sprockets, and derailleur, compared to a mid-drive system. Powering this kit is a Lithium-ion battery pack, made with Samsung 18650 cells. They’re configured as 13 in series and 4 in parallel to offer 48 volts and 11.6 amp hours (though Jason advertises 11 to set expectations more realistically). 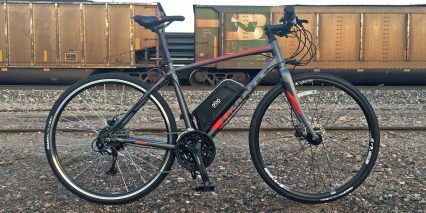 Hub motor powered ebikes tend to feel zippy and fun, but aren’t as efficient as most mid-drives. They work easily with throttles, don’t require a custom frame design to interface, and aren’t as vulnerable to rock strikes (lowering your mid-frame ground clearance as a mid-drive might). 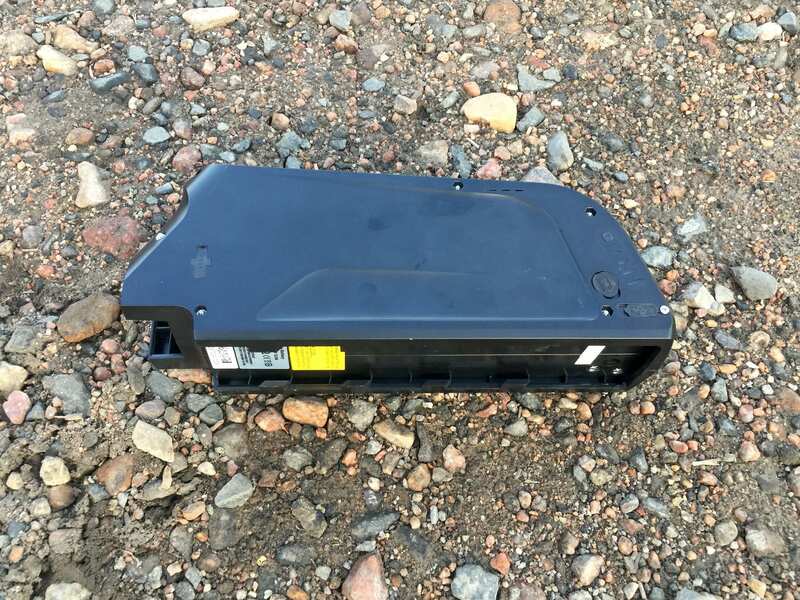 So, the battery pack itself is reasonably lightweight at ~7.1 lbs, and it interfaces with a plastic slide which you need to screw onto your frame somewhere. There is a sturdy metal track inside the plastic slide, with long slots for inserting bolts. Ideally, you’ll be able to mount this to bottle cage bosses on your downtube. This is what was done for the Giant demo mountain bike you see in the video and images above. It positions the battery weight low and center while protecting it from getting kicked as you mount. Lithium-ion cells are known for being relatively lightweight but very durable and long lasting. They don’t develop a memory if you forget to charge them right away, but they are still heat and cold sensitive. Jason recommended recharging after the pack had been depleted to around 20% vs. recharging after every short ride. He explained that this would allow for more full cycles, and help the cell chemistry last longer. However, if you go below 20%, there’s a chemical change in the batteries and this could be hard on them. 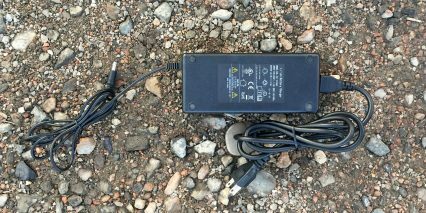 It’s best to store the battery pack in a cool, dry location, and you can charge it either on the frame or off. It locks securely to the frame but has a hinged handle on top for safe lifting. I do have a few gripes about the battery pack, and the first one is that the slide mount only attaches with two bolts in most cases. Compared to purpose-built e-bikes, it’s just not as sturdy or nice looking (newer bikes have batteries that are sunk into the downtube a bit for even lower weight and sturdier positioning like this). The EBO Dolphin style battery pack may not fit at all on some youth, folding, or step-thru frames (and for that, EBO has the Cruiser kit with rear-rack battery mount). The battery has three ports in the right side (a fuse, charging point, and USB port), and I found the rubber charge port cover a bit tricky to seat properly… I had to be intentional about lining it up exactly before pushing in with some force. The USB port on the battery is disabled because Jason said it can slowly discharge the battery (potentially taking you below the 20% point). 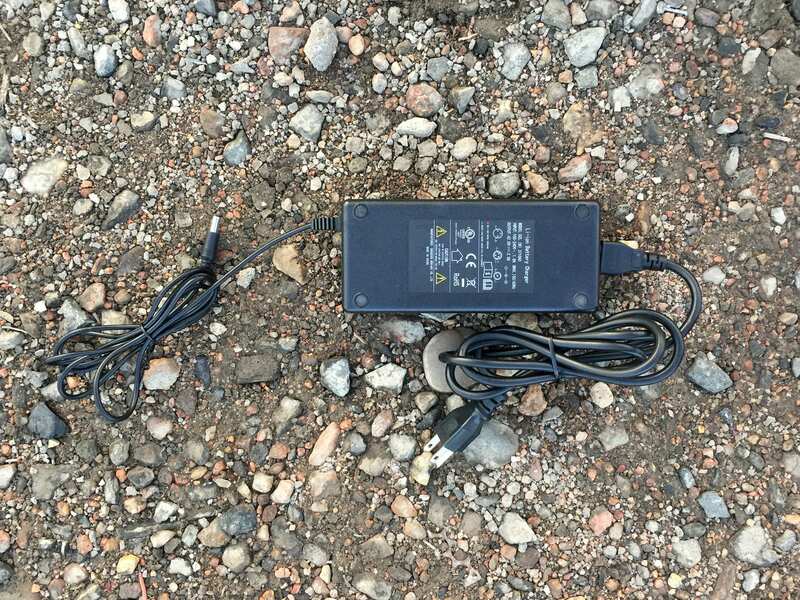 The battery charger itself is pretty basic, providing 2 Amps of power output for regular charging speeds, it’s not super compact or lightweight at ~1.9 lbs, but is still small enough to toss into a bag and bring along on rides. My final complaint about the battery pack is that you have to turn it on independently from the display, and this takes a few extra seconds. The time isn’t such a big deal, but you also have to remember to turn it off after each ride (or the pack can slowly drain), and if you hop onto the bike before turning the battery on, you might have to bend way down or twist in an uncomfortable way to activate it. This is a minor gripe, one that isn’t unique to EBO kits or even purpose-built electric bicycles, but one worth noting. And so, let’s imagine that you have charged the battery, mounted and locked it to the frame, turned it on by pressing the silver circular button on the left side (which has a blue LED glow once activated). Now, you can finally press the power button on the control pad! Actually, you hold it for a couple of seconds, and then the LCD screen (or LED console) comes to life. 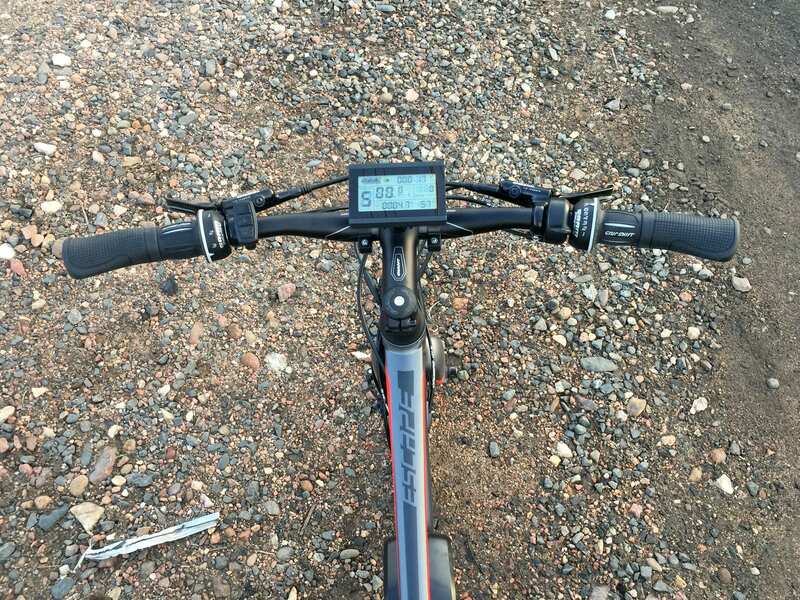 The default display hardware is a beautiful backlit LCD with integrated USB charging port, but EBO does offer to swap it for a basic LED console to reduce handlebar clutter and limit the fancy look of the kit (which could attract unwanted attention in some situations). As much as I love the LCD, and will be focusing on it from here on out, the LED pad is nicer than average because it shows a speedometer in addition to the current charge level and assist mode. Neither one of these two display panels is removable, but both can be swiveled a bit to improve readability or reduce glare. So, the LCD shows all sorts of menus but only uses three buttons to operate. And they are located within reach of the left grip, on a remote button pad. This control system combines simplicity with depth, and is intuitive to use, without requiring that you look down all the time once you get the hang of it. The power button in the center of the remote button pad allows you to cycle through trip stats like odometer, trip distance, average speed, max speed etc. and the up and down arrows allow you to raise or lower the assist setting. 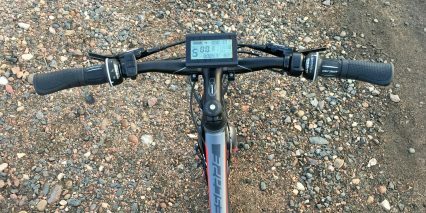 By default, the bike is set to assist level zero, so that the throttle is inactive. 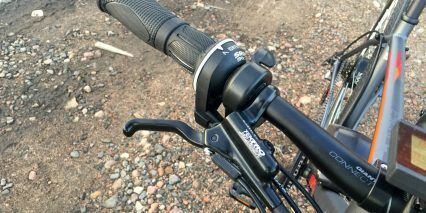 Once you arrow up to 1-5, the pedal assist sensor goes live and you can instantly use the throttle with full power. Again, it ramps up smoothly and feels a bit more refined than some other systems I have tried, but is definitely more zippy than the EBO 36V Burly kit. I prefer to pedal with an efficient, lower level of pedal assist, with occasional bursts of power to catch up with friends or climb hills, and this system lets me. Whether you’re riding in bright light or darkness, the LCD should be viewable, because you can hold the up arrow to activate backlighting. Holding down will activate walk mode if the bike is not moving more than 6 mph already. If you enable cruise control in the settings (by holding up and down simultaneously) you can then hold the down arrow if you’re using the throttle at any set speed above 6 mph to activate cruise control and give your wrist or thumb a break. It’s a feature I don’t see a lot, and one that some people might really appreciate for long commutes our touring. There are so many settings to explore here, including lower top speeds… or more or less sensitivity in the cadence sensor. Jason convinced me that eight magnets was enough for their cadence disc (verses 12 magnets that I have seen on some other ebikes and kits). He explained that the disc itself is smaller and less likely to be bumped, but also still very responsive. 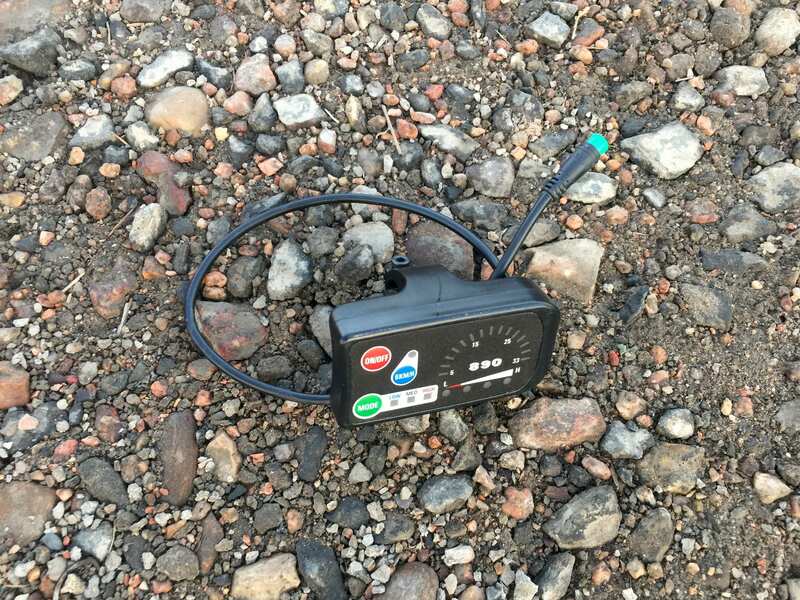 Apparently, some people want to set their cadence sensors to be less sensitive, so that the bike won’t surprise them if an accidental partial pedal stroke is made, and you can indeed make the cadence sensor less responsive with the settings menu here. The cadence sensor itself is one of the more difficult parts to install with this kit, because it requires a bottom bracket wrench or help from a shop to get on. You have to take the crank off first and actually slip the sensor and magnetic disc over the spindle. It’s not an easy clip-on design, but the benefit is that it should be more sturdy and reliable in the long run. In short, I appreciate how the display that comes with this kit is so useful and that this bike can be customized to perform as you prefer. 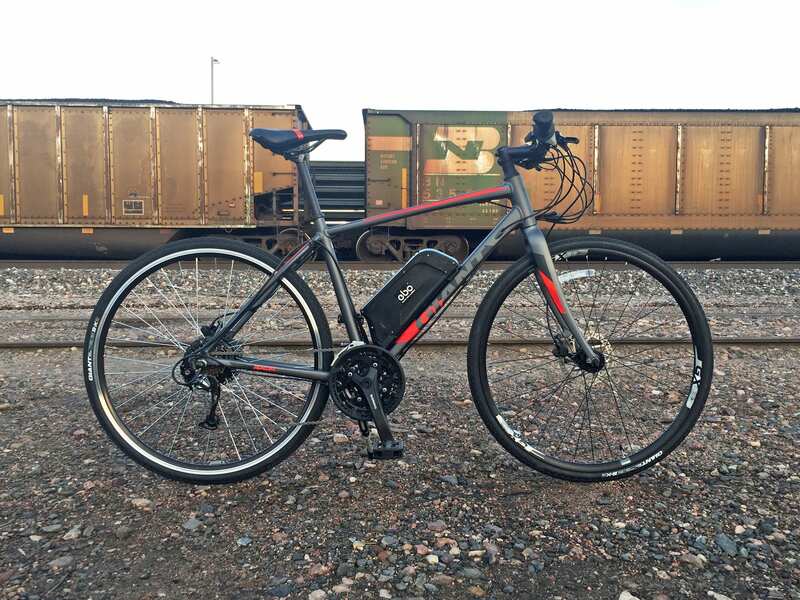 It’s not limited or locked up like most purpose built ebikes… it even gives you USB power for maintaining a phone, music player, or lights on the go. When conducting this review, Jason had explained that the display had a 20 second lag for the current speed to register (based on their new firmware that works with 36 and 48 volt motors. I was thankful that Jason was aware of the issue and honest about it as we talked on camera, he has since resolved this issue (late February 2018) but I wanted to keep this note for those who might have an older version. A the end of the day, this kit is using proven hardware (a geared hub motor and cadence sensor) that isn’t as fancy as some of the newest ebike technology, but gives you lots and lots of options for how to operate it. 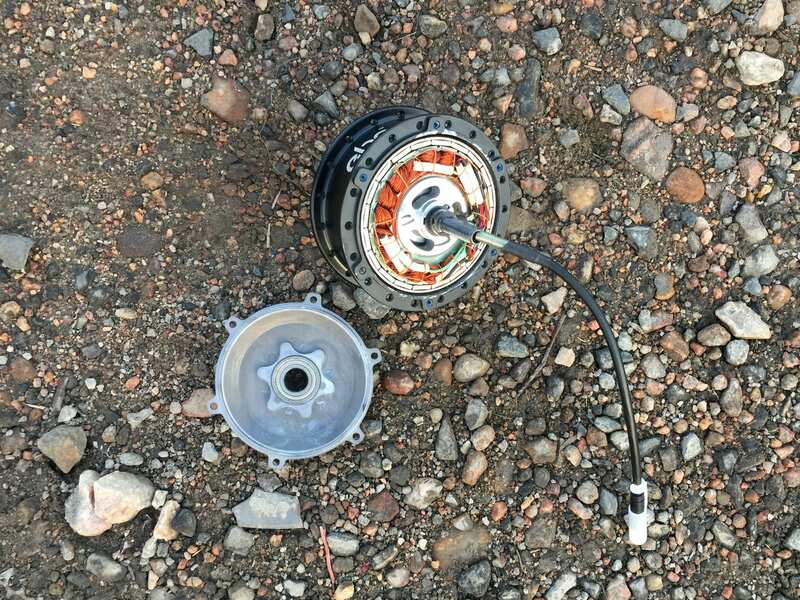 Even though cadence sensors are known for producing more of an on/off feel, the motor has been designed to ramp up smoothly, so it isn’t as jerky or startling. The control systems are intuitive, but deeper than normal, and not locked. This kit will appeal to people who want to ride a bit faster or have more weight to move around (body weight, cargo, or a heavier bike). 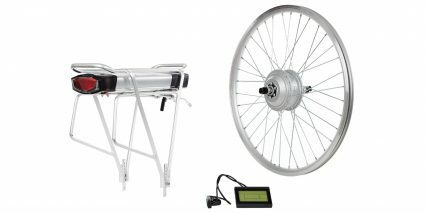 You can coast efficiently with this kit because there is no cogging or reduction gearing at the bottom bracket, it’s easy to pedal around even when the motor is turned off because it only adds ~15 lbs to the bike (the Giant Escape road bike conversion I reviewed here only weighed ~40 lbs total). I meet a lot of people who want larger batteries, and it appears that you can actually daisy-chain packs and accomplish that here! I saw a really cool setup on a recumbent trike with two batteries being built with the 48 volt Burly kit while visiting the shop and I show this in the video for a moment at timetamp 8:20. For me, the 350 to 816 watt output of this kit was very satisfying, but I only weigh ~135 lbs and enjoy pedaling. There’s always a trade-off between cost, weight, and performance with bicycles, and this was one of my favorite kits on offer for a single-person electric bike experience. For people who want more power, check out the 48 volt 500 watt Mountaineer kit. Big thanks to Jason and his team for hosting me and partnering with me on this review. It was nice to catch up with him and see how the product has been refined since 2015. He is expanding in a way that seems sustainable, definitely growing, and I love that his support is still above average for the industry (at least the kit industry). It’s part of the slightly higher pricing, and also what makes dealer sales possible. 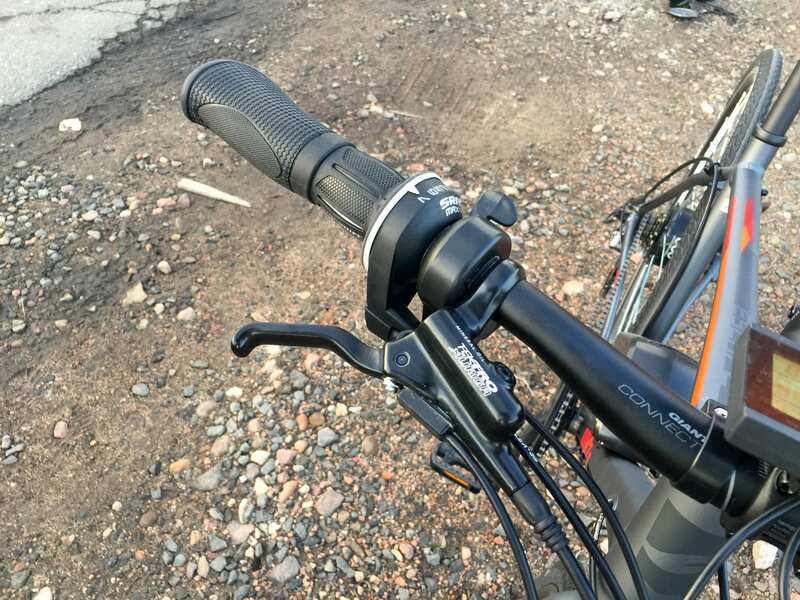 I was impressed to hear that several Denver ebike shops actually carry his kits and offer them as an alternative over purpose built products. There’s something to be said for recycling an existing bike, breathing new life into an old favorite, or building a truly custom setup that isn’t available anywhere else. Hi Juan, check this list of lightweight ebikes out, the Faraday Porteur comes in around 40lbs and there are some compact and carbon models that are even less. The Desiknio Single Speed is around 30lbs.